There are many types of vessels involved in maritime construction and salvage projects, and few are more important than spud barges. 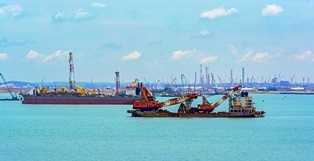 Unfortunately, spud barge work can be particularly dangerous, since it combines the risks of a typical construction site with the hazards of the maritime environment. Pile driving. Pilings are necessary for docks and bridge supports. Marine salvage. Cranes mounted on spud barges facilitate dredging and canal maintenance. Pipeline operations. Oil rig and pipeline repair operations need a base for workers. Construction. Spud barges provide stable platforms for heavy equipment during the development of docks, piers, and bridges. Back trauma. Back injuries can be caused by sudden trauma from falls, or they may occur over time due to repetitive lifting of heavy objects. Crush or amputation injuries. Spud barge crew members may have their hands or fingers crushed while removing a spud pin, or when they become trapped between heavy objects. Struck-by injuries. Workers can be struck by a swinging crane arm or an object hanging from the crane, resulting in broken bones and spinal cord injuries. Slip and fall injuries. Since spud barges are essentially floating construction sites, they contain numerous trip and fall hazards. These may include loose building materials, slick walking surfaces, and improperly-guarded stairways. If you were injured while working aboard a spud barge, you might be entitled to receive payments for your medical bills and loss of income. You need an experienced maritime injury attorney to help you collect the compensation you deserve. To learn more, contact the law offices of Steve M. Lee, P.C., by using the form on this page.